Increased militarization of police forces led to the 7-year-old’s death. It’s time we all recognize that. The trial of George Zimmerman for the killing of Trayvon Martin will grab most of the major headlines this summer, but there is another trial involving the death of a black child that warrants our attention. 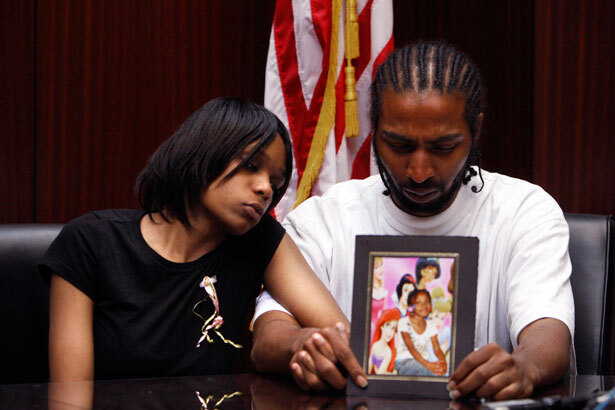 Yesterday, June 18, a judge declared a mistrial in the case of Joseph Weekley, the Detroit police officer charged with involuntary manslaughter after shooting and killing 7-year-old Aiyana Stanley-Jones back in May 2010. Weekley was the lead officer in a raid on the home of Chauncey Owens, a suspect in the murder of a 17-year-old. The Special Response Team (Detroit’s version of SWAT) entered the home just after midnight, throwing a flash-bang grenade through the window and kicking down the unlocked door. Aiyana was asleep on the couch. Weekley fired a single shot that struck her in the head and killed her. The police entered on the first floor; Owens lived in the upstairs unit. Weekley was indicted on October 4, 2011, and his trial started on May 29 of this year. He faced up to fifteen years in prison, but after three days of deliberations a jury was unable to reach a unanimous decision. Even if what Weekley claims is true, that his weapon was discharged by accident after a tussling with Aiyana’s grandmother, the entire ordeal could have been avoided if the police acted as police should. If it sounds irrational to require a SWAT team to apprehend one man accused of killing one person, that’s because it is—but it has become standard operating procedure. What happened to Aiyana is the result of the militarization of police in this country, itself a byproduct of the “war on drugs.” Over the course of the past thirty-plus years, police have become more and more reliant on military weaponry and tactics (big and small police forces alike have bazookas, machine guns and mini-tanks for domestic use) in response to crime. They hardly pretend to be interested in information gathering, investigating, protecting and serving any longer. New York City’s Mayor Bloomberg wasn’t being hyperbolic when he said he has own army in the form of the NYPD. The same is true for mayors across the country, and the people most vulnerable to these heavily armed militias just so happen to be among America’s most maligned. Part of what it means to be black in America now is watching your neighborhood become the training ground for our increasingly militarized police units. The issue is that while, ideally, police would be interested in maintaining peace, when you turn them into soldiers who believe they’re fighting a war they will do what soldiers in a war zone do: harm and kill indiscriminately. Children aren’t exempt. If the death of 7-year-old Aiyana isn’t enough to change the way we feel about our militarized police forces, perhaps a more selfish motive would do. Writing to political prisoner Angela Davis in 1970, James Baldwin told her: “…we must fight for your life as though it were our own… For, if they take you in the morning, they will be coming for us that night.” What Baldwin knew was that the attack on Davis was not just an attack on her, or black women, or self-proclaimed communists or the black liberation movement. It was an attack by the powerful on the powerless. And sure enough, if the powerful get away with one attack there will be more to come. Concern about paramilitary police forces sprung up in the wake of the Occupy movement and the excessive force experienced by protesters, and somewhat in the aftermath of the attacks on 9/11, but they got their start in predominantly black neighborhoods. And the country collectively shrugged because the specter of black criminality loomed large. If you want to know what’s going to happen to powerless people of any color in this country, watch what happens in black America. If you don’t want it at your doorstep, show concern when it affects the least protected and most marginalized among us. We’ve seen these forces in action in Seattle, New York, Chapel Hill and Anaheim. But it wouldn’t be that way if we cared enough to stand up and demand an end to this when kids like Aiyana were placed in harms way. Can lessons learned in Iraq be put to use in Syria? Read Bob Dreyfuss’s analysis here.